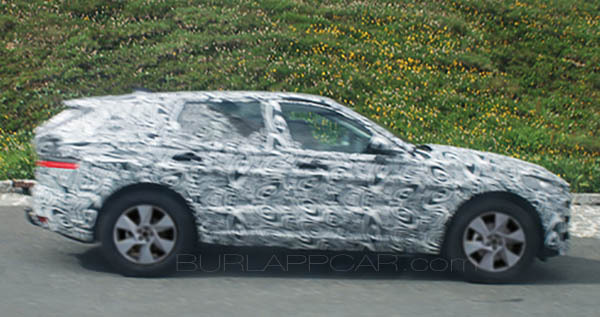 This isn't the first time we see a bit of the upcoming "large" Jaguar SUV. But most pictures have been of a test mule. using the F-Pace body. This prototype looks different. Even under all that camouflage you can see a longer and maybe lower, body. This almost looks like a large jacked up wagon. Maybe they don't want to compete with Range Rover too much? Even though luxury SUVs are all the rage these days, Jaguar has already announced the new J-pace will not be their flagship. It will be the all new XJ sedan coming up. I think a large "Cadillac Escala" type large hatchback would be great. And make it an EV! It would be a fantastic flagship for Jaguar. Something that would really compete with Tesla, while being truly different from the S-Class and 7 series.